1. Earnings season continues: It's a big week for the media industry. Time Warner, 21st Century Fox, Facebook and other media giants will release their third quarter results. Last week, AT&T (T) announced an $85 billion mega-deal to buy Time Warner (TWX). If the deal passes the government's regulatory review, it could go down as one of the biggest media tie-ups in history. Time Warner owns CNN, HBO, Warner Bros. and other channels and websites. There's also a lot at stake for 21st Century Fox (FOX) in the aftermath of Roger Ailes's exit. The former Fox News CEO resigned after anchorwoman Gretchen Carlson sued him for sexual harassment, prompting other women to come forward. The case was settled for $20 million. 2. 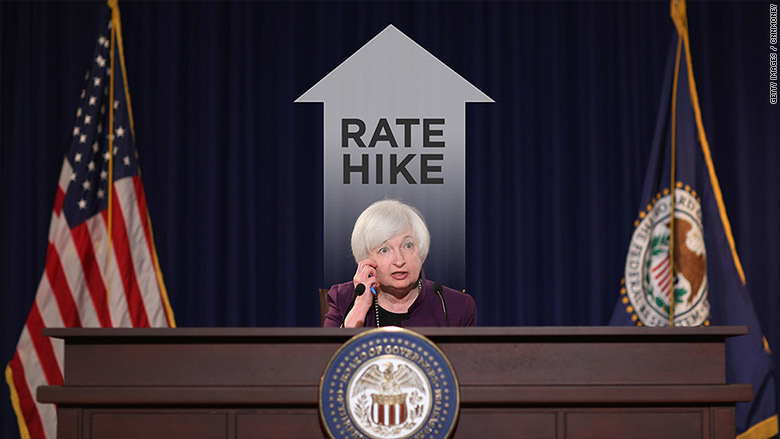 Federal Reserve meeting: The Fed has been waiting for the perfect moment to raise interest rates. But that moment probably won't come during next week's two-day meeting, especially given the fast-approaching presidential election. Wall Street predicts the Fed will raise rates in December, one year after it last hiked them, according to CME Group. Overall, things are looking up for America's economy. It expanded at an annual rate of 2.9% from July through September compared with the same time one year ago. That's the fastest economic growth in two years. 3. Jobs report: Get ready for another jobs update. On Friday, the Labor Department will report on how many jobs were added in October. In September's report, the U.S. added a steady 156,000 jobs and Americans pocketed 2.6% fatter paychecks compared with this time last year. Unemployment rose slightly to 5% from 4.9% as more people entered the job market. 4. Bank of England's rate decision: Will the U.K.'s central bank raise interest rates? Between Brexit and rising inflation, there's a lot to consider going into Thursday's decision. When Britain voted to leave the EU in August, the Bank of England cut interest rates to prevent a recession. And it has paid off. Earlier this month, the British economy reported 2.3% growth. Analysts believe the boost came from an increase in tourism. Vacationers can't seem to get enough of the U.K. now that the pound is at historic lows.